← Netflix’s 128 Slides on Culture. Awesome. 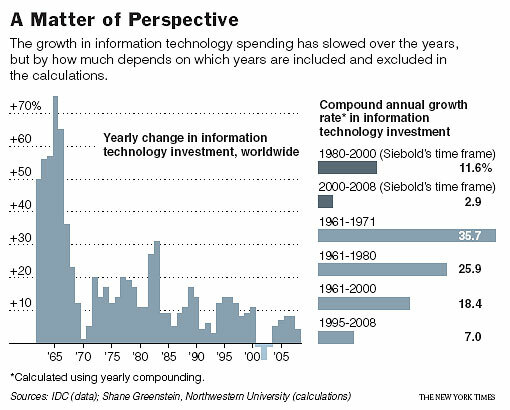 It struck me as unduly and anecdotally negative on the future of information technology. It reeked of a “the party’s over because I’m leaving” mentality. Some of it felt like pure spin. When talking about his new venture, C3 (which I think stands for carbon-concious consumer), Siebel seemed to go miles out of his way to position it as an energy technology company, not an information technology company. But, as far as I could tell, it was going to make a software application to help enterprises manage their carbon footprint, kind of an ERP for carbon. Quoting Siebel: “an application to monitor, monetize, and mitigate the carbon footprint.” To me, that’s clearly information technology. Basically, it felt like his thesis was “IT is dead, long live ET” and any, uh, “facts” that contradicted it were overlooked or spun away. So I was happy to see this piece in the New York Times this morning, Are The Glory Days Long Gone for IT?, which challenges some of Siebel’s claims. The chart above shows the peril’s of defining the world by one’s own experience. While Siebel characterized 1980-2000 — Siebel’s prime years — as the go-go years of IT, in reality, the fastest period of IT growth was between 1961 and 1971. Timothy Bresnahan, a Stanford economist, similarly does not accept Mr. Siebel’s contention that the decline in growth rates this decade, which encompasses two recessions, signals a permanent end to I.T.’s record of growing faster than the larger economy. “It is early days to say the game is over,” he said. To me, the latter point is critical. Rather than defining the future of the industry by its recent growth rate or by one person’s successes, we should define it in terms of work left to do. And from that perspective, there is plenty of work left and plenty of growth associated with that work. In my estimation, it’s not that 1980-2000 were the two big decades of IT, they were the two decades of data. The growth that Siebel refers to was all driven by the relational database, the applications layered on it, and the analytics on top of those applications. One key reason I joined Mark Logic was that, in some way, I agree with Siebel — we are hitting diminishing marginal returns — not on IT overall — but instead on what we can do with data. While we have seen great strides in what we can do with data over the past 30 years, content, by contrast, still lives in the stone ages. Documents are stored redundantly. They’re not centralized in databases. They’re not re-used. They’re not controlled and managed by applications. They’re not analyzed. Compared to data, content is the Wild West. It’s my belief that this will change, and change radically, over the years to come. The full story, written by San Jose State business school professor Randall Stross, is here. Good Afternoon Dave,I must say that I partially agree.1) I do believe that what ever we want to call Utility, cloud etc. That lower level tasks will become less and less relevant (ie plugging wires / servers etc)When housing was first electrified, you needed to be half electrician to keep it running. Now we just look look in the phone book.So I believe that lower order IT skill will end up somewhere between electrician and plumber in your local directory.2) Where I disagree, is that I believe IT will need to be moving into higher abstraction levels around data management, governance, analysis, cost benefit, relationship management etc.Will more and more of our IT resources continue to come from outside our walls? Yes,But will you be able to plug in a cable and by magic have exactly the information, processes and work flows just appear? No!It will still need management attention – lots of it.